BEAUTIFUL REALISTIC LOOKING DECORATIONS This set includes 6 Medium floating flowers all one color, made of soft foam plastic. These are made for indoor and outdoor use. A tealight candle can be added in the center of the flower. They do NOT have a light. There is a ring on the bottom that is designed so a weight can be added to keep the flower in place in the water. Great for special events such as: bar mitzvahs, christenings, confirmations, anniversary's, quinceaneras and brunches. And awesome for restaurants, hotels, ponds, pools, water features, Mother's Day, etc. Included is a one year guarantee. Just click on the yellow button to get this ordered as there is a limited supply of this size and color. 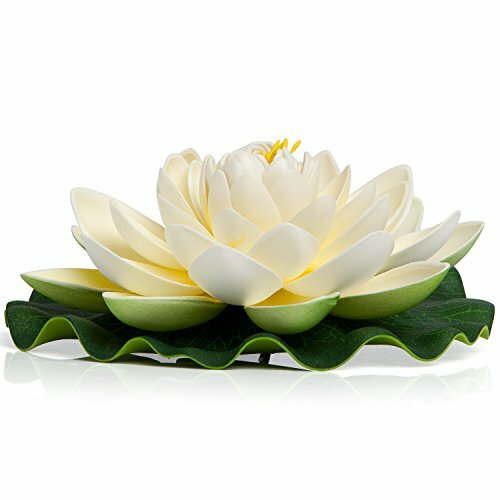 ✅ SET OF SIX EXTRA LARGE FLOATING FLOWERS: These are great for creating that perfect lily pad look that will last in every season. Sitting Frog Pond Spitter -stone statue/sculpture-water garden accent- Great Garden Gift Idea!